Mumbai: India’s sport of Kabaddi has grown leaps and bounds with the growth of India’s flagship kabaddi league, VIVO Pro Kabaddi. 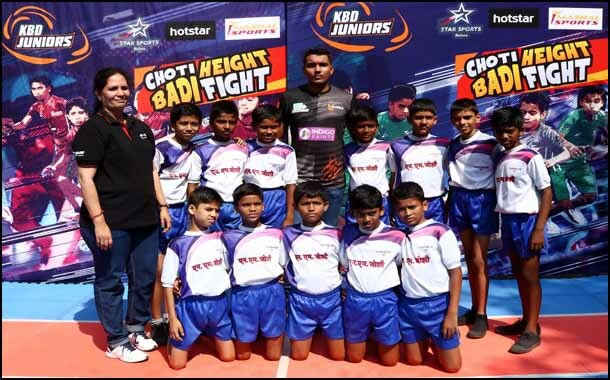 Encouraging the growth of the sport amongst the younger generation, Star Sports has begun the second season of KBD Juniors – an inter-school Kabaddi championship. School kids from Mumbai got an opportunity to meet one of their favourite star Arjun Deshwal, from U Mumba at AFAC English School, Chembur, Mumbai. As Arjun Deshwal entered the school, kabaddi fans were enthralled and during the meet and greet, curious kids had several questions for Arjun Deshwal about the sport. Educating and motivating the school children on the sport, Arjun Deshwal also played a match with them. Eight city schools will test their grit against each other at The National Sports Club of India (NSCI), to enter the round of city finals. The tournament showcases 24 schools across 12 cities, and 3,500 students between the age group of 11 to 12 years battle it out to make it to the grand finale. In Season 2 of KBD Juniors, 24 schools are divided into 8 groups of 3 teams who will play against each other. From each group, the team finishing first will then make it to the round of city finals, which will take place during the home leg of each city as part of Season VI of VIVO Pro Kabaddi and then the National finals.